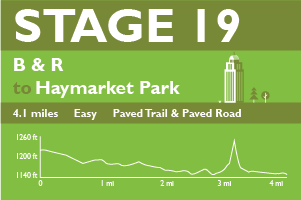 The 76 mile course is broken into 19 stages and a team finish with each runner taking on about three stages. 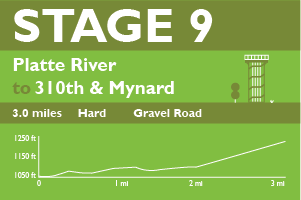 Stages range from about 3 to 5 miles on a mixture of bike trails, paved roads, gravel roads and highways between Omaha and Lincoln. You’ll love it, we promise! Take a visual tour of the course. 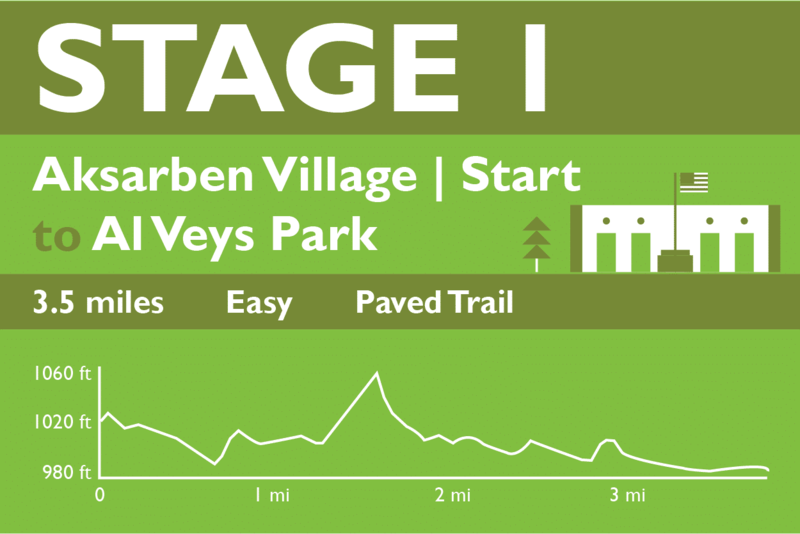 Kicking off the day from the epic start line in Arksarben Village in Omaha, runners will head south on a flat to slight downhill section towards Al Veys Park. 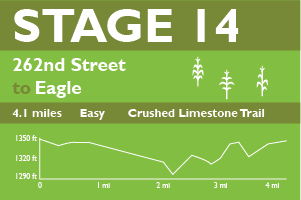 Stage 1 is run entirely on the paved Keystone Trail along the Little and Big Papillion Creeks. 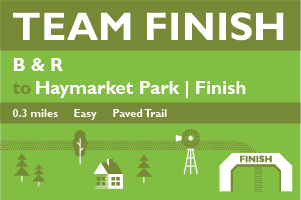 Runners will slice through Omaha passing neighborhoods, parks, businesses, and swimmming pools before arriving at Al Veys Park to meet their next runner. Leaving Al Veys Park runners will continue heading south on the Keystone Trail towards the next exchange point, Twin Creek Cinema, located in in Sarpy County. This section of the Keystone Trail is flat and features several wooden bridges that cross over inlets to the Big Papio Creek that the stage follows. Runners will pass urban and rural features including farms, parks, and neighborhoods making their way into the city of Papillion. 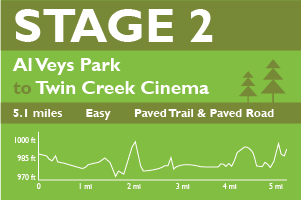 Near the end of this leg, runners will make a sharp right hand turn over the creek onto the paved Papio Trail and will arrive shortly at the Twin Creek Cinema exchange point. 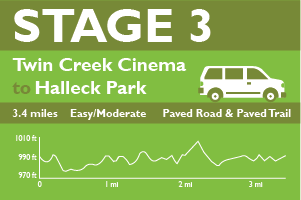 Leaving Twin Creek Cinema, runners will head west following the paved Papio Trail allong Papillion Creek towards the next exchange point at Halleck Park. Returning to a more suburban setting, runners will pass golf courses, parks, and the Bellevue Berry and Pumpkin Patch. 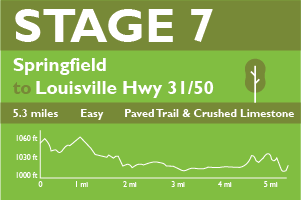 The trail is relatively flat but features a few underpasses that have short steep hills. Leaving Halleck Park, runners will pass a small lake and continue heading west following the Papillion Creek.  Runners will turn right to navigate a round-a-bout to underpass 96th Street and will be greeted by a long, steep hill. At the top of the hill, runners will turn right into a residential neighborhood on Santa Fe Circle. DO NOT miss this RIGHT TURN as it connects to the Highway 370 underpass into Walnut Creek Lake Recreation Area. 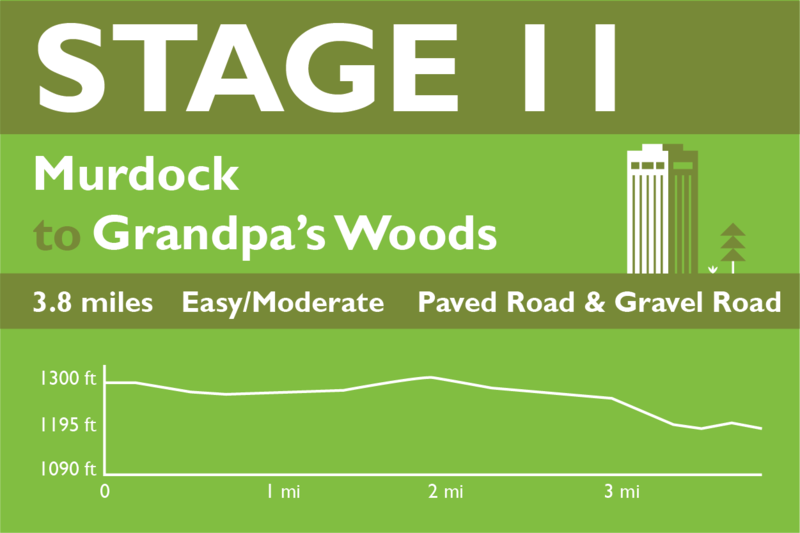 As runners leave the tunneled underpass, they will be greeted by a forest and a winding path through Walnut Creek Lake. At the top of the hill, runners will turn right and run across the dam. Here the paved trail winds around a tall grass prairie around the lake until runners turn right at the “High School Trail” intersection to meet their teammates at Papio South High School. Leaving Papio South High School, runners will return to Walnut Creek Lake via the same route as arriving runners. Now cruising downhill runners will follow the paved trail around Walnut Creek Lake until they reach the park exit on Turkey Road. Runners will head south and follow Turkey Road out of the park across Schram road. Here runners will enter rural Nebraska and its famous gravel roads. Turkey Road has a nice mixture of rolling hills and flat sections. 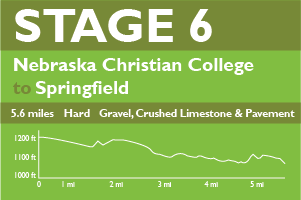 Runners will turn right onto Capeheart road and follow this hilly gravel road to 114th Street where they will turn right again towards the exchange point at Nebraska Christian College. 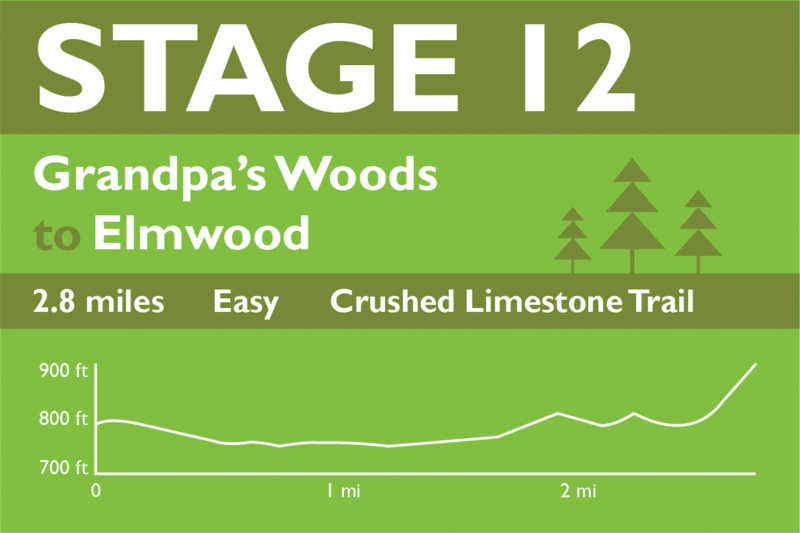 This is one of the longest and hardest stages on the course. The route has a good mixture of gravel roads, crushed limestone trails, and paved small town roads. 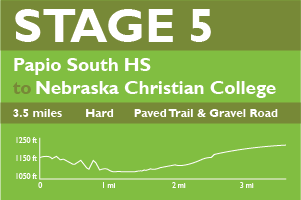 Runners will leave Nebraska Christian College and head south on 114th Street. This relatively flat gravel road will give you the full rural Nebraska experience. At approximately 1.20 miles runners will turn right onto Fairview Road. Runners will follow this rolling gravel road about 2.5 miles until they turn south on the crushed limestone Mopac Trail. The last mile features paved roads through the town of Springfield before reaching the exchange point at the Sarpy County Fairgrounds. 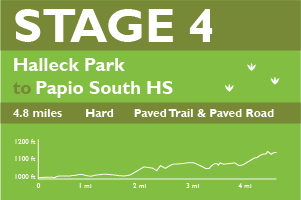 Leaving the Sarpy County Fairgrounds, runners will head south on the Mopac Trail towards mighty Platte River. This flat section of the course is often inside the comfort of overhanging trees and starts off besides a small stream. Most of the leg runs parallel with Highway 50, but is often hidden from the runners view. Runners cross several bridges and a lake. 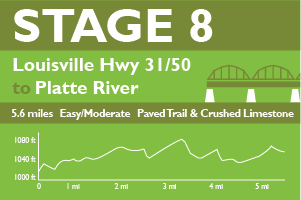 At the end of the stage, runners will pass by a small pub by the Platte River before going underneath Highway 50 to reach the exchange point near the town of Louisville. 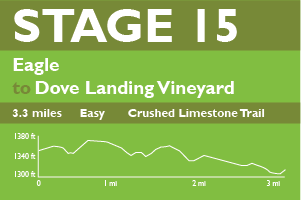 Leaving the exchange point, runners will head west on a crushed limestone trail along the winding Hwy 31 adjacent to the Platte River. This stage offers some of the most scenic views on the entire course. As runners approach the Platte River pedestrian bridge, they will turn left into a parking lot at around 4 miles heading downhill through tall cottonwood trees before they reach the bridge. The pedestrian bridge gives a great view of the surrounding bluffs and state parks. 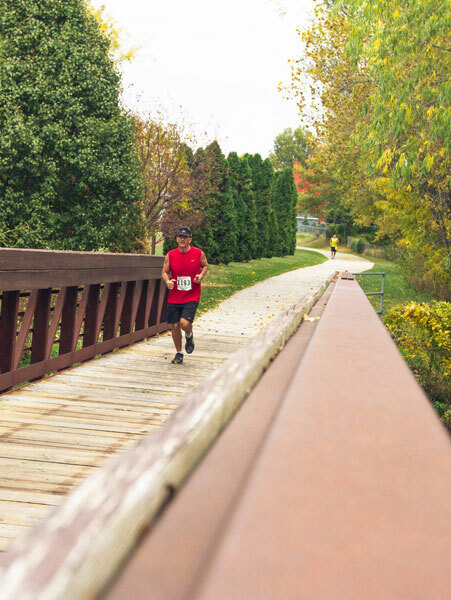 After crossing the bridge, runners will meet their teammates near the village of South Bend. Leaving the exchange point at the Platte River Bridge trailhead, runners will run a difficult section but scenic section following gravel roads through beautiful rural Nebraska. After tackling a monster hill, runners will pass the baton off to their teammate at the intersection of 310th & Mynard Road. Nice work! Surrounded by farm land and rolling hills, this stage is quintessential rural Nebraska. On this stage you’ll pass a quaint white church a well as one of the quilt-pattern barns located in Cass County. This leg ends in the village of Murdock near the high school. Leaving the village of Murdock, runners will cruise down 2nd Street before turning back onto paved 310th Street. 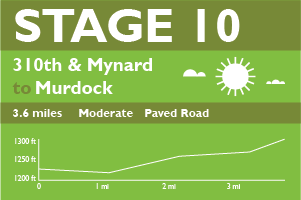 This flat section of the race is wide open, so any wind will be noticed on the open farm land. Runners continue onto gravel roads before arriving at the unique exchange point at Grandpa’s Woods Golf Course. Less than a mile south of Grandpa’s Woods Golf Course, 310th Street meets up with the crushed limestone Mopac Trail which will take the relay all the way into Lincoln. This relatively flat section of Mopac Trail, heads southwest underneath hanging trees and over numerous streams. The trail was once a Missouri Pacific Railroad line that was abandoned in 1984. The land was the purchased by the Nebraska Trails Foundation for us all to enjoy! Runners will meet their next runner at the exchange point in the town of Elmwood. Leaving Elmwood, runners will continue on the Mopac Trail heading southwest. 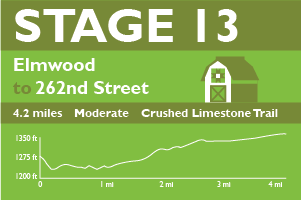 The first mile of this leg gains about 100 feet in elevation and is not as tree covered as the previous stage allowing runners to see the surrounding rural landscape. Racers will reach the next exchange point at 262nd Street. Runners continue down the Mopac Trail heading west towards the next exchange point in Eagle, Nebraska. This relatively flat section of the Mopac Trail runs parallel to O Street and passes Wright Cemetery on the runner’s left. As soon as runners reach Eagle, they will make the transition to the next runner. 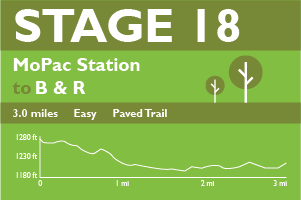 Leaving Eagle, runners will again be surrounded by a canopy of trees above the Mopac Trail. Runners continue heading west and will cross over O Street. 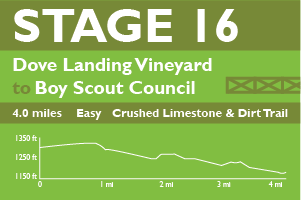 The exchange point is at Dove Landing Vineyard on 176th Street, just south of the trail. The Mopac Trail continues through rural Nebraska for most of this section. Use caution when crossing 148th Street, the road is paved and the trail is difficult for drivers to see. Shortly after crossing one of the wooden bridges, runners will turn right onto dirt “horse trails” that will take you to the exchange point through an open gate into the Boyscout Cornhusker Council’s property. Your team will be waiting for you to make the exchange. 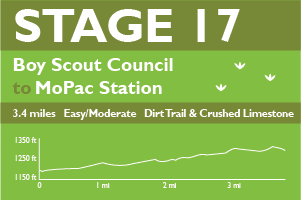 Leaving the Boyscout Cornhusker Council, you will have a short off-road section before returning to the Mopac Trail. Soon you will pass the silos of Walton. This section of the course is covered by tree canopy and there are now signs of Lincoln fast approaching. Runners may start to notice an increased number of birds in this section especially when they pass the Audubon Grassland Prairie area before 100th Street. Runners will pass a small country estate as they run over A Street at about 98th Street. Continuing down the crushed limestone trail, runners pass YMCA’s Sprit Park before reaching the exchange point at the MoPac Station Trailhead on the outskirts of Lincoln. Starting on the eastern edge of Lincoln, runners cross 84th Street and continue on the Mopac Trail. The trail changes from crushed limestone to a paved recreation path. Heading west, runners pass through residential areas past Wedgewood Lake and then cross over O Street on a pedestrian bridge. Quickly cutting through Lincoln, runners pass a local nursery before they cross 66th Street and then Vine Street. From here, the trail continues through residential areas until runners make it to the exchange point shortly after they cross the 48th Street bridge. The next runner continues heading west toward downtown Lincoln. After Peter Pan Park, runners will continue on the Mopac Trail over 27th Street on a pedestrian bridge. After crossing over the bridge, runners will head south a few blocks until they reach Vine Street, before turning towards the University of Nebraska. Runners continue on Vine until reaching the Antelope Valley trail and turning towards downtown. Following the lit trail, runners will head towards Memorial Stadium, home of Husker Football. Immediately after passing the stadium, runners will cross over to Lincoln’s historic Haymarket District, where they will meet their crew at the Team Finish. You did it! Join your entire team and make a dash to the finish line together. It’s now time to celebrate your accomplishment at the Post-Race Shindig. Congratulations! Leg ratings are 90% based on elevation and surface and the remaining 10% is based on distance. Distance is rounded to the nearest tenth of a mile.